Six evil villains combine their talents to defeat Bibleman and his three sidekicks. Cheater, 2Kul 4Skul, Super Pro Game Master III, Slacker, Professor Snortinskoff, and I.M. Wonderful link up with L.U.C.I., the evil computer, to wipe out Bibleman once and for all. 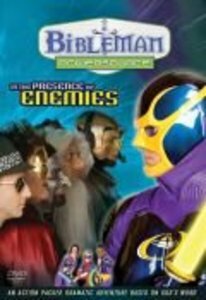 If there's strength in numbers, then six evil villains should be able to combine their talents to defeat Bibleman and his three sidekicks. Cheater, 2Kul 4Skul, Super Pro Game Master III, Slacker, Professor Snortinskoff and I.M. Wonderful link up with L.U.C.I. the evil computer to wipe out Bibleman once and for all. Will the Bible Adventure Team fall for their dastardly trick? Can these six bitter antagonists rise above their squabbles to achieve a truly wicked goal? Will I.M. Wonderful manage to keep her hair in place during the decisive battle? Don't miss the ultimate test of our caped hero-and find out if he'll live to quote scripture another day. About "In the Presence of Enemies (Bibleman Powersource Series)"